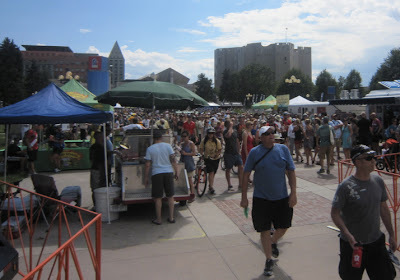 I spent the week chasing the USA Pro Challenge and blogging about my experience as a fan. Playing tourist in my own state of Colorado. There have been years when I travel 1 hour to the airport by car, 15 hours to France by plane, and 1-4 hours in a rental car every day to be a fan at a stage race, and paid thousands of dollars to do so. Yesterday morning, I got on my around town bike and rode 12 minutes into downtown Denver. 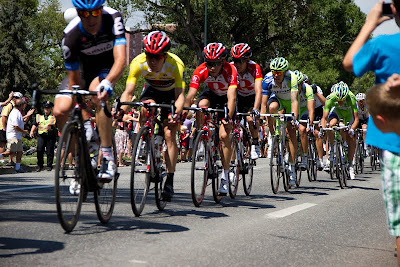 Even though I have been following this race a week, it is hard to believe that this level of professional cycling is within minutes of my front door. After a brief orientation on how to recognize (and cut-off) a drunk person (I am sure for insurance reasons), we the bar-tending volunteers, took our positions pouring beer inside the beer garden at Civic Center Park in Denver. Remember how I mentioned the event required over 4,000 volunteers! We were a small percentage of the total effort put in by citizens across this state. It was a beautiful very hot day in Denver. Most of the fans lined the edge of the route and we were not swamped until after the race was over. I showed up to the volunteer sign-in desk in the morning to the sound of my friend Kathy Zawadski shouting out "Karen!" We teamed up together as volunteers for the day. Kathy made it fun to be there. There were two other volunteers with Kathy and me in the beer tent. One of the others, Mark, was pulled away early because they needed another male volunteer to track the riders marked for drug testing for the day. Mark ended up having an incredible experience at the finish line waiting for the riders to cross the line. The rider he was assigned to was one of the 5 riders to DNF the stage, so no sample was taken, and Mark did not get to finish his job following his assigned rider from the finish line through the drug testing procedures. At each stage, the stage winner, the overall race leader, and two random riders are selected for drug testing. Mark faithfully returned to our beer booth. I was able to leave my volunteer post for my late "lunch break" to attend the final press conference in the Denver Post Building one block from my volunteer location. This was a wonderful experience. For so many years I have watched the press conferences online, finally I was experiencing what it was like to be there to see the press room and rows of tables with technical equipment and working journalists. 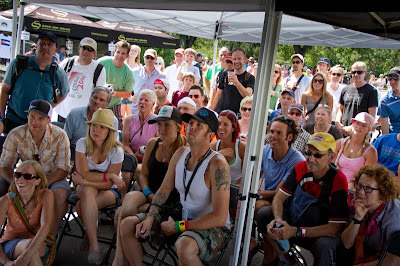 To listen to the panel of riders answer questions, to see another view of what goes into to making this event happen. Read more about the Positive comments about the race that I heard at the press conference. Basically lots of thirsty fans with varied knowledge of cycling. Kathy's husband Jon Heidemann stopped by to say hi, he and Kathy run Peak to Peak Training Systems, offering Level 1 coaching, training, and nutritional services, with a performance center, to athletes in the greater Denver area. They have tremendous success in training athletes, both juniors and adults, and are general fantastically fun to be around. Early in the morning, before everything was set up, I came across George laying on the ground, well that is just bad mojo right there I thought, so Kathy and I had some fun. We couldn't let George lay there by himself! Vendor Expo Festival in Civic Center Park and spectators waiting for the racers to arrive. Fans found shade within the Shack Tracker tent and watched the race approach. 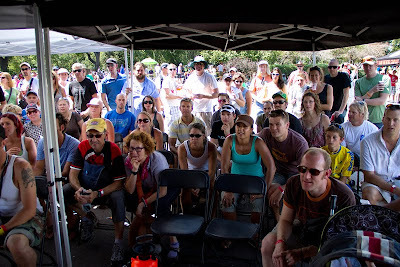 Meanwhile, this was the scene at the free Diggity VIP tent down on Bannock and Speer as the fans sat watching the race on TV. This is what the race looked like from their vantage point on Speer Blvd. 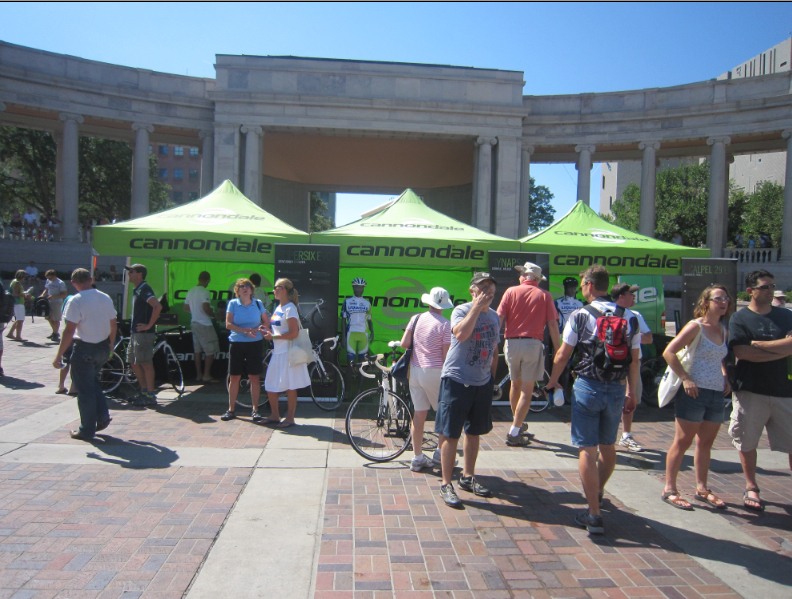 Back at the finish area in Denver (below), with the VIP tent to the right. The VIP tent located in Denver for the final stage of the 2011 USA Pro Cycling Challenge was located at the finish line. Fans who got there early could rest at tables and chairs, by the time the fans arrived from the Golden start, the VIP area was getting crowded. Samantha, a fan, reported to me, that it appeared the VIP area had been almost double oversold, and more than over-capacity. She was told they sold over 1800 tickets to the VIP tent in a space that was intended to hold 1000 fans. Eventually they did not have enough seating or food. I understand there were a number of gate crashers in this VIP area. I hope that next year the VIP organizers provide the space and services the fans expect when purchasing VIP tickets at the finish of the tour. I also think they should check off the passes at entry or check ID. Certainly not every VIP tent is created equal. The word from the Race Organizer Shawn Hunter, is that the race will return to Denver in 2012. The word from Mike, one of the fans (and I think he reflects the sentiment of a few others), is that the "The final Podium set up is horrible!!!!!!!!" "I understand the money from the sponsors, but only a couple hundred other viewers can get in the street and watch. Next year MUST be set up to allow the masses to view the podium ceremony," he said. Strange how the only complaints I heard all week came from the last day in Denver. 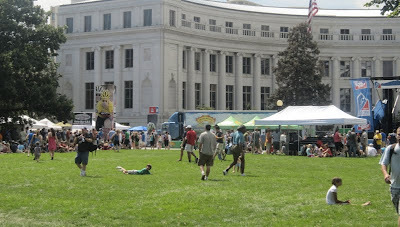 Meanwhile from where I was pouring beer, the center of civic center park was not crowded at all. Perhaps they need to set up a Forest Gump (speech on the mall) scenario for the mass of fans to see the final podium presentation in Denver. They even have the large pond! Forrreeest! could become Leeevviiii! 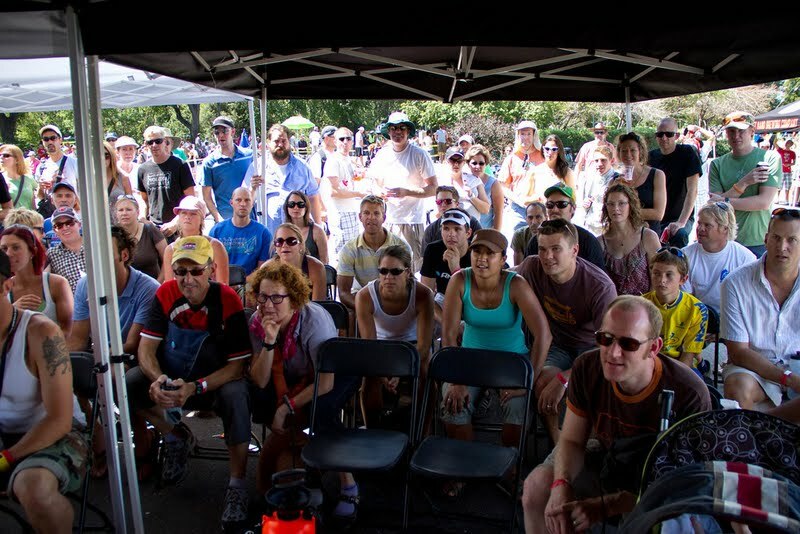 Thank you, it has been an exciting week of adventure and fun at the 2011 USA Pro Cycling Challenge. Let's do it again next year! Less lycra, more sunscreen, less barriers to the fans, and much much MORE COWBELL!!! !